A career in the Travel and Tourism Industry will require from its aspirants a certain flare and a lot of confidence along with strong interpersonal skills. Someone who is looking to be a part of the tourism industry must have the hunger to learn new things every day, along with the knack of staying update with the latest news, socio, economic trends and a strong geography. India might be marked as flabbergasting number 41 in the top countries visited worldwide but it is sought to get better in years to come. The Tourism Sector in India might have seen a slump the previous year as compared to the previous year but it has managed to pull its weight and show an Annual Growth Rate of 4.3 per cent till June 2013. Although it would seem all glamorous but the industry has much more to offer and requires hardworking and diligent individuals. Keeping in mind that there is no dearth of job prospects in the tourism and travel industry, on completion of your tourism studies, one can venture into the many lucrative aspects of the industry. Well groomed individuals are the need of any industry and especially ones where direct client interface is as much as this industry. The country requires more and more skilled, confident, well groomed and diligent aspirants to be a part of the travel and tourism industry. You can opt for diploma, certificate, undergraduate or postgraduate programs to be a part of this budding industry. The minimum eligibility criterion for taking admission to a tourism course at the undergraduate level is the completion of Class XII. On the other hand if you’re looking for an admission to postgraduate programmes, you must be a graduate from a recognised institute and also appear for an entrance test and clear the group discussions and Personal Interviews. Distance Learning programs in Tourism and Travel management are also provided by many institutes along degree courses, certificate courses, PG Diploma and degree courses, etc. The Travel and Tourism industry is a one such industry that even though it is relatively new than the others but is growing and is also expected to do well in the coming years as well. There are many concerns and industries that are direct contributors of the industry and hence in the long run create greater job opportunities to those who would want to be a part of the industry. Hotels, restaurants, retailing, transportation, travel agencies, tour companies, tourist attractions, leisure, recreation and sport, and cultural industries are some of the contributors to the industry. Also, as per popular researches and studies, the tourism sector has created about 11 million jobs and has the potential to create another 37 million jobs in the future. Although the future of the industry is quite bright but still there is a lot of development in terms of infrastructure and skilled personnel. Tourism Department: There are jobs as Reservation and counter staff, Sales and marketing staff, Tour Planners and Tour guides. There is also the requirement of Information assistants at the office of the Tourism departments who are selected through competitive examinations held by the Staff Selection Commission. The option of working as a Guide is also listed under the tourism department as the Ministry of Tourism recognizes three types of guides; regional, state and local. Airlines: One can opt between being the ground staff or in flight staff. Apart from working as Airhostess/ Stewards, you can look into the option of Traffic Assistance, Reservation and Counter Staff, etc. Hotels: The Hotel Industry being a service industry, serves the basic requirement of food and accommodation. One can choose from Operations, Front office, House keeping, Food and Beverages, Accounting, Engineering/ Maintenance, Sales, Public relations and Security, etc as one of the many departments to work with. Tour operators: They are the ones who help organize conducted tours to the various tourist spots and manage the travel and stay of the tourists. 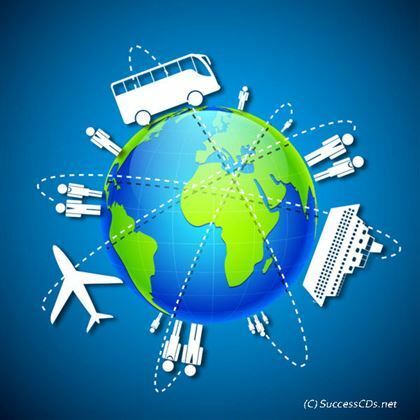 Travel Agents: Travel agents evaluate the requirements of tourists and businessmen and help them make the best possible travel arrangements from the many available. Many resorts, travel groups use travel agents to promote their tour packages to travelers. Transport: Apart from airlines, travelers require rail services, coach operators, car hire companies to go from one place to another - by air, road, railway, sea etc. All this is take care by the ones handling transport.